PrimaSoft car cataloging software allows you to organize and manage all car inventory related data. 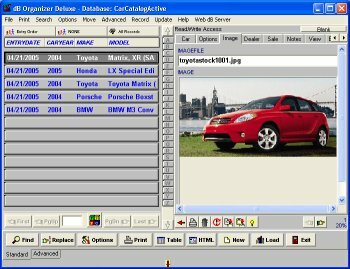 Car Cataloging Organizer's intuitive interface and ready-to-use software solutions make it easy to set up and use. Software Solution Template: organize all your car information (car year, make, car model, engine, sales price, mileage,..). Our solution has two databases. Car Catalog Active for maintaining all active car listings. Car Catalog Sold to store information about sold cars. Software Solution Template: organize all your car information (car options and description screen). Software Solution Template: organize all your car information (car image screen).